What is a Thai Train without the alcohol? Phuket Town has a growing collection of high quality street installed in lots of different locations around the town, although the highest concentration is in the China Town area around the Thalang Road. 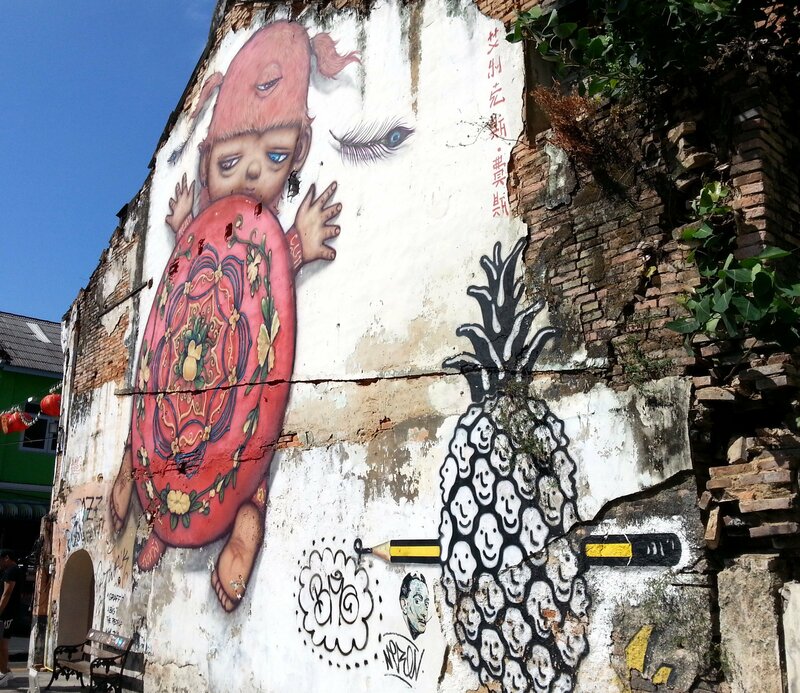 The street art in Phuket Town has not appeared randomly, it’s part of an organised attempt to brighten up the town’s street administered by by a group known as the 4studio with the blessing and assistance of the Phuket Office of the Tourist Authority of Thailand. 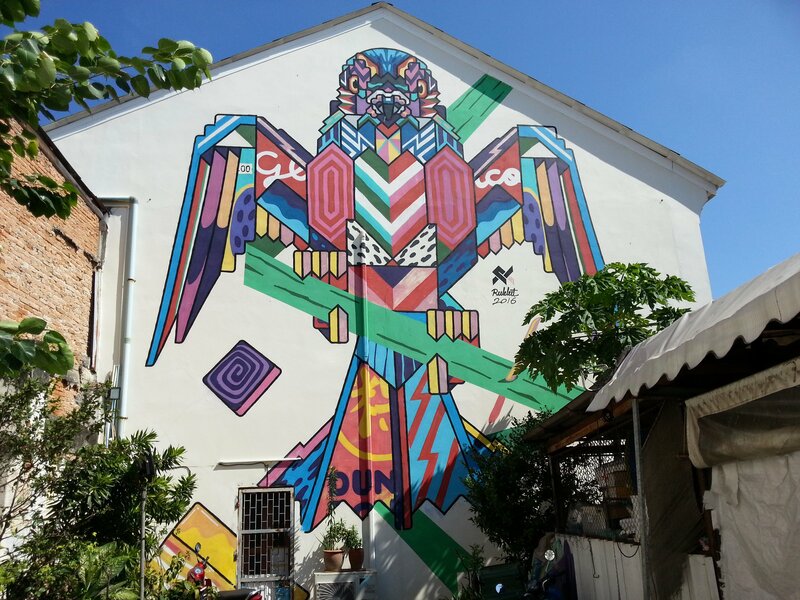 South East Asia’s urban street art movement has been steadily growing since 2012 when the first organised street art in South East Asia appeared on the streets of Penang. The creator of the first street art in Penang, and the best candidate for the person who could hold the title of being the ‘father of the South East Asian street art movement’, is Lithuanian artist Ernest Zacharevic. Zacharevic followed up on his work in Penang with another very successful series of murals in Ipoh in 2014, effectively demonstrating that street art can be installed in places of historical importance without adversely affecting what is good about what’s already there and also that good street art attracts visitors which is good for the local economy. The street art in Phuket very much fits in with the themes of the broader South East Asian street movement. 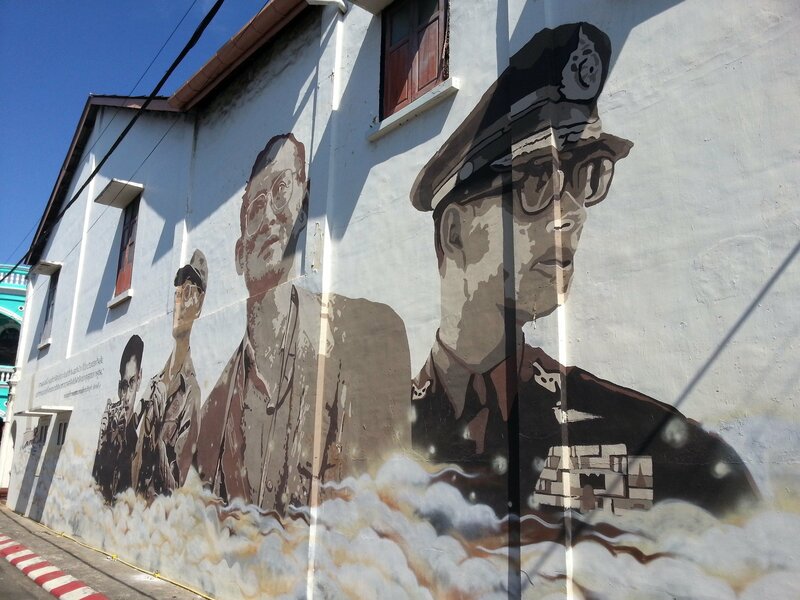 Like the street art in Penang and Ipoh, the street art in Phuket Town focuses on themes which are important to local people and relate to local life on the island, even if in an obscure way. Not all street art in Thailand is following this path. For example, the murals created by local artists in Phatthalung are a celebration of local culture, whereas the street art which rapidly covering Thong Sala in Koh Phangan is entirely created foreign artists and is simply pop culture which has nothing to do with the local people or their culture. We congratulate Phuket Town for getting it right. 4studio is now in its second season of encouraging the production of street art in Phuket Town. The first season saw the installation of some larger murals created by artists invited to come to Phuket from other parts of Thailand, as well as some international artists. Season 2 is very different with the focus changing to local artists invited to paint murals on the theme of childhood experiences in Phuket. Season 2 also led to the painting of a mural celebrated the life of King Rama IX who passed away in 2018. The large wall murals on the Thalang Road are located near the intersection with Soi Rommani. The complete 2019 Guide to travel in Thailand by bus, train and ferry. Tickets, timetables, and maps. Find out the best value for money hotels all over Thailand. Reviews, maps and booking.